One of the main issues with having a car parked out in the sun is how hot it gets inside. Things get even worse if the car has something like leather seats or metal elements inside. Those will get very hot and will just make it almost unbearable when first stepping in. It is something most drivers are accustomed to and hate the most about using the car in the hot summer days. Leaving the discomfort factor, sun heat can cause also damage to the interior of the car. Many parts may experience discoloring when exposed to intense heat and sunlight while other plastic parts can simply develop cracks and break. A good solution is to get a large windshield sun shade that can repeal sunlight and reduce the amount of heat accumulated inside. They can be made out of various materials, and even the cheapest sun shade can make a significant difference. The most common issue is getting the right size. Having an SUV and getting a very small sun shade will just let some of the heat get trapped inside. For our list, we trimmed down the options and selected just 10 different sun shades of various sizes and made out of various materials. 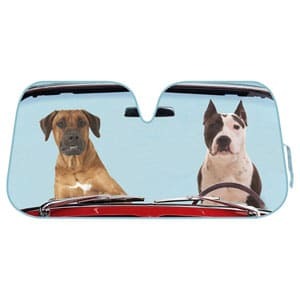 Custom Accessories large nylon car sun shade is a good and versatile option. 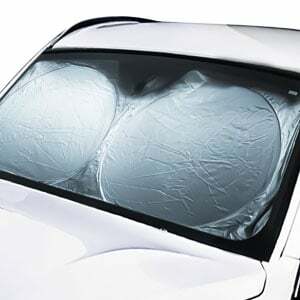 Sizing should not be a problem since it comes as a pack of two shades which can overlap as much as needed depending on the car windshield size. The price makes it very affordable even if the quality might not be that great. Still, they do the job they were designed for. The main problem that the sun shade has is the material from which it is made. It does a good job at repelling heat, but it is just too thin. It feels like it can get damaged very easily just by touching a sharp object. This does help them not get too hot and transfer the heat inside, but it affects the durability of the sun shade. 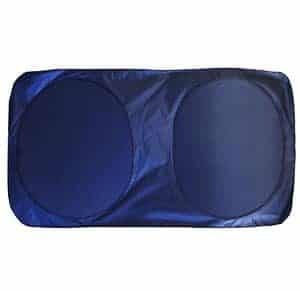 OxGord auto car sunshade is a good pick for the ones that have the problem of leaving the car parked for long periods of time outside in the sun. The product is made out of a heavy reflective material, and it is foldable. Not being a solid piece of material makes it work with both small cars and SUVs. The model is not that expensive and does a good job at not letting the heat inside. The sun shade is decent, but the actual product is a bit different from the picture offered by the manufacturer. It is not as reflective, but it is still a good pick. It does reflect heat but not very efficient. The selling point is the fact that it is flexible, works with all car sizes and has a decent price tag. If the classic silver colored sun shade seems a bit boring, then the BDK auto windshield sun shade might be a good alternative. It actually comes with various prints including animals, landscapes and many more. It is an affordable sunshade that does its job pretty well and works with most large cars such as SUVs. For a regular sedan, it might be a bit too big. The fact that it becomes flexible when exposed to heat makes it not stand up correctly. It is easy to put into place, but if it is not properly anchored, it will fall down. The sun shade also gets very hot and will require a bit of care when taking it off. Due to its size, the sun shade only works with large cars. 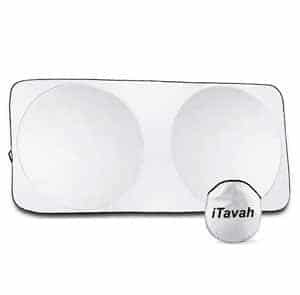 iTavah windshield sun shade offers a good deal for the price. It is a high-quality shade made with a durable UV reflecting material and a foldable design. According to the manufacturers, it offers a universal fit and works with SUVs, vans, trucks and small cars. 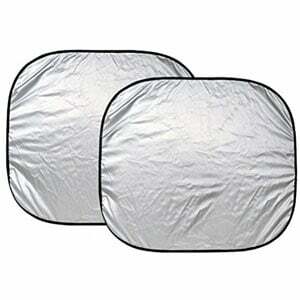 Also, the sun shade is available in two different sizes. The sunshade comes with a small carry pouch or case. What does not make all that much sense is the fact that it is difficult to fold back to fit it inside the pouch. Also, the fabric hangs down from the corners which mean that some small corners of the car interior will be exposed to sunlight and heat. Looking at the price and the universal fit, the sunshade is a decent pick. 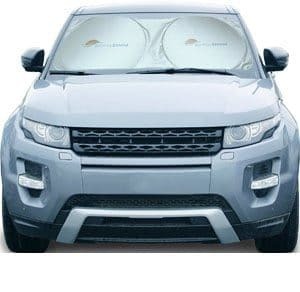 Auto Expressions windshield sun shade is one of the more expensive products in our list. It is not all that special when compared with other models but it does look as if it is made with greater care for quality and detail. The model is available in multiple sizes and several different patterns to choose from. Having a printer side and not using a silver coating means that it is not good at keeping the heat out. The sun shade gets quite hot and the heat is transferred inside. They offer good coverage over the windshield which means that it is still better than not having a sun shield at all. 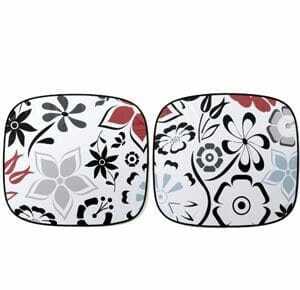 What will appealing to some is the fact that it comes with a modern print instead of the classic shiny silver coating. Outback Shades offers a wide selection of windshield sun shades of various sizes. 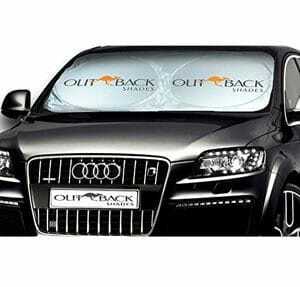 Their standard outback sun shade offers premium protection for large vehicles such as SUVs, trucks, and vans. The product was designed to be foldable and flexible around the edges in order to provide maximum coverage regardless of the car type it is used on. Truth be told, there is no sun shade that can completely block the heat. The Outback sun shade is decent but there are better options that do a more decent job at keeping the interior from burning up. The material used is durable and very easy to install. It is very easy to fold and fits quite well in the small pouch it comes with. SnRayShield auto sun shade managed to be both inexpensive and quite good at preventing the car interior to heat up under the summer sun. It is a simple windshield sun shade made in one piece with a flexible design that makes it fit most cars. It has two rigid circles but it can still be folded to fit inside the small pouch it comes with. The material from which the sun shade is made feels rather flimsy. Being so thin means that it can get torn quite easily. Also because it is a plastic material it can get cut when in contact with sharp objects. Having the silver coating helps a lot when it comes to keeping the interior not so hot. It fits on most cars, and it is very easy to setup and fold. Pro Shade UV reflective sun shield is a simple product that is not much different from other shades in our list except that it does a better job at keeping the interior safe from the heat. It has a simple design with a soft fabric material and it is very easy to setup. The corners can be folded and when opening it, the shade simply pops out making it very convenient for regular daily usage. The shade is decent for the most part, but it tends to be difficult to setup. Managing to get it to stay up will prove to be a bit challenging without some kind of support since it has just a soft fabric at the top. Heat reflection is quite good as it uses a high-quality material. Removing it and folding it back into place takes less than a minute. 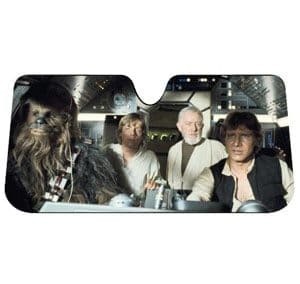 Plasticolor Star Wars Accordion Sunshade is something that maybe not everyone would enjoy. Star Wars fans will like the shade especially since it is an officially licensed product. It is a folding shade which makes it very easy to store. It does not heat up as much when exposed to direct sunlight which means that the interior remains a bit cooler as well. One issue with printed sun shades is the fact that sunlight affects the colors. After some time, the image on the Plasticolor sun shade will look all washed up. The good news is that the shade is very cheap which means that replacing it will not be a major effort. In terms of utility, it is capable of reflecting most heat and keeps the interior safe from damage. The shade-it sun shade is the most popular product in our list. It is not much different from other sun shades but it does tend to do a better job at reflecting heat and keeping the UV rays from damaging the interior. The shade has a universal size and can fit most cars but the manufacturers do offer it in multiple dimensions. Similar to other shades the model is a bit difficult to get it to stand up. The upper and lower side are not reinforced and can be folded easily which makes the problem a bit worse. However, it is set up properly it should be able to cover the entire windshield and reduce the amount of heat that gets trapped inside. 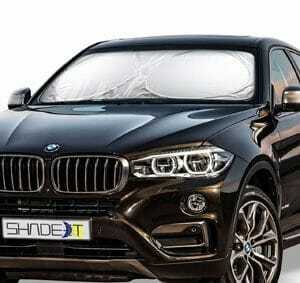 The model will fit most cars but the manufacturers still offer it in several different sizes. Truth be told it is difficult to judge just by looking at a picture which sun shade is better. Each model has pros and cons. Still even the most disliked sun shade still offers some utility. The biggest problem comes with sizing. 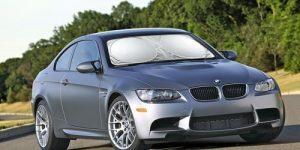 Sun shades come in various sizes just like the windshield of a car can have various dimensions depending on the model. Some sun shades do have a universal fit but it is still a good idea to check if the manufacturer offers multiple sizes. For our list, we picked only the best-selling models that have a decent rating. The lower end models that did not make a list are usually made using only a very thin material or they just do not cover the windshield properly. Pricewise, they are all affordable and there is not much of a difference between the more expensive ones and the cheaper windshield sun shades.